Oh, how I love snow days. 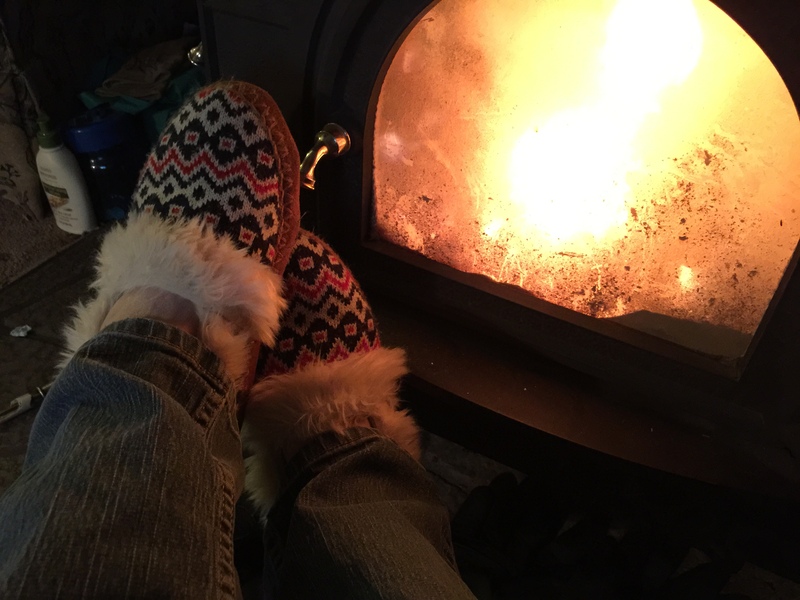 Days when I can stay home on the farm, cook a good meal from scratch, make desserts and sip tea by the fire. Made some good potato soup and cornbread on Saturday. Just sitting and watching the dozens of cardinals out the front window. They always looks so vibrant against the wide landscape. 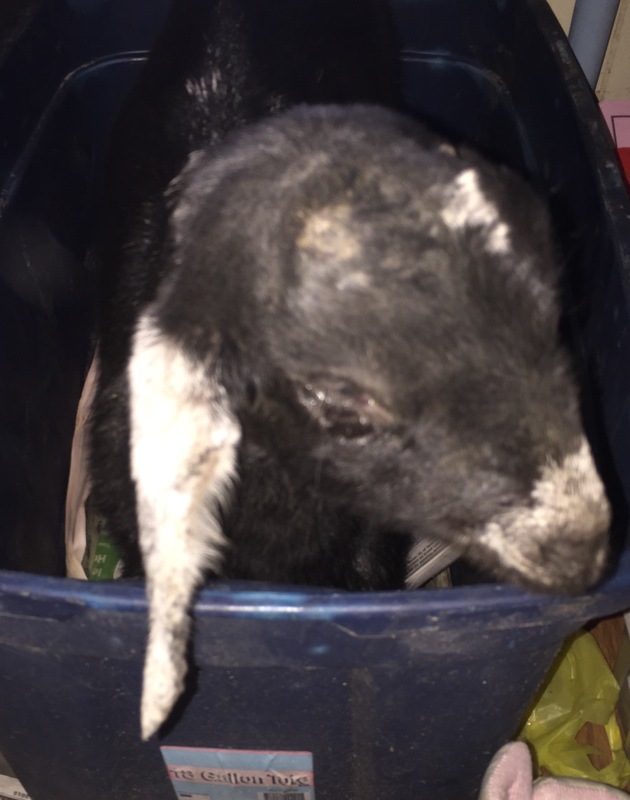 Had a baby goat that got scours and was pretty weak, so he spent the night in the house in a large tote so he could be warmer and we could tend to him and watch him. I wondered how long it would take before he figured out that he could get out of that tote… and I was sure it would be during the night. I had visions of waking up in the morning with little goat pellets all over my house. 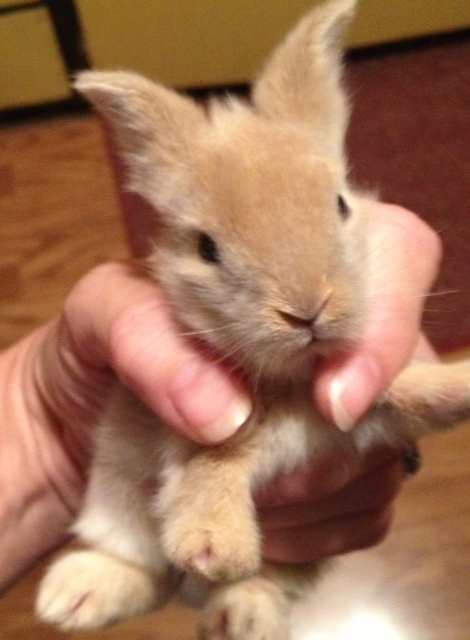 However, sleep escaped me most of the night as our little guy cried for his litter mate who was outside in the barn. So, I got up in the night to feed him a little bit at a time – very reminiscent of having a newborn. I sure don’t miss that days. Oh, I actually think I forgot to mention that we had these two new additions to the barnyard. I’ll give them their own post after this baby get back on his feet. First of all, peel and cut small cubes of russet potatoes, however many you need for your family. Cover barely with water, add about a tablespoon of salt and boil until tender. In the meantime, dice about a 1/2 onion and saute in a whole stick of butter.. use two sticks if you have a lot of potatoes. Also, fry a few slices of bacon real crisp. Drain on paper towel. When the potatoes are done, do not drain – just mash them in the water with a hand potato masher, leaving a few chunks for texture. This is where the the ooohs and the aaahhhs start. Stir in that butter and onions and then about 2 or 3 cups of heavy cream..(if that scares you you can use half and half) I get fresh, raw Jersey milk from my neighbor and it has about a quart of cream on top.. If I’m not making butter with it, it is great for potato soup. Then, just for kicks, I add about a 1/2 package of cream cheese (sometimes I say ‘what the heck’ and put the whole 8 oz. package in there – what doesn’t taste better with cream cheese in it?) Then, if I happen to have some, I add sour cream. Now we have the creamiest potato soup you ever wanted to have. Spoon this into bowls and top with grated cheddar cheese, bacon, and some fresh chives. Serve with homemade cornbread baked in an iron skillet with lots of homemade butter. 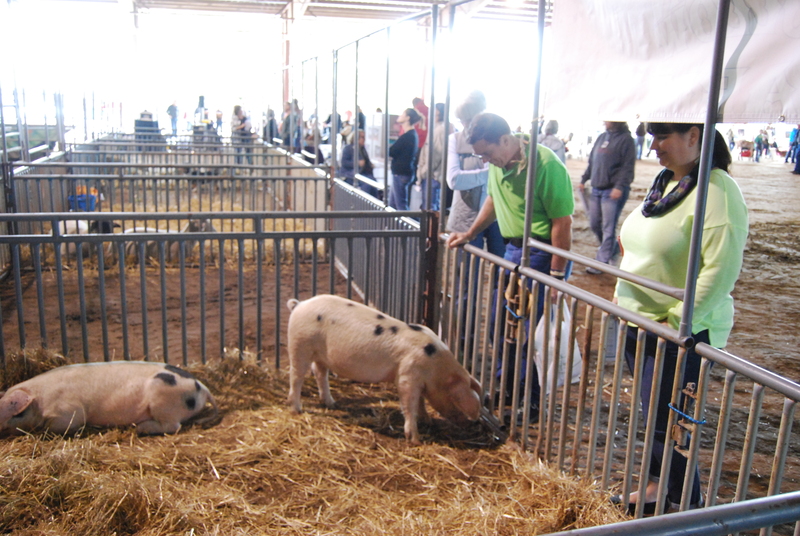 We needed to separate the girls from the boys recently.. gilts from boars that is – that means girl pigs from boy pigs. Well, the strangest thing happened that I am still scratching my head about and I’m certain it wouldn’t happen again in a million years. The weekend before, all the boys (human boys) helped to get the gilts to a different area of the farm – being they are more than 100 pounds for sure we grabbed them, wheel barrow style, and put them in the trailer to move them. Not an easy task.. it’s the stuff America’s Funniest Home Videos are made of. But, we got the mission accomplished. Things are easy when you have lots of help. The next day I noticed that the we missed one..Ugh! I’m not sure how that happened.. because it’s pretty obvious who is who from the backside — but nonetheless, we left one of the girls in there with all of the boys. I wondered how I was going to handle getting her out of there.. My husband and oldest son were watching football. I knew that a request to stop watching football to move a pig was futile. So, my lovely daughter-in-law and I took to the outside with the kids to pull some weeds, and just enjoy the sunshine. We still wondered if there was any chance that gilt was going to get moved on this nice sunny day or have to wait for another day, probably when it was cold and wet, when we had more people willing to help. As we stood there taking videos of my 2-year-old grandson talking to the pigs and making pigs sounds, here comes a another pig just walking up to us. We quickly realized it was the gilt we needed to move. She must have gotten through the fence in the front pasture somehow and made her way to the girl club in the back pasture. We promptly opened the gate, coaxed by a little feed and easily led her in with the other girls. Okay, so what are the chances that? 1. The gilft in question would be the only pig that gets through the fence. 2. That she would make her way all the way to the back pasture. 3. That we would happen to be standing there at the time. I had just been thinking about whether we should be working so hard outside on a Sunday instead taking a day of rest or if it even mattered since it was so enjoyable… and not at all work – more like therapy – a reprieve from the corporate world. So, I figure that was my answer… a directive to not work so hard and go rest…. and let God do the work. Isn’t that how we are a lot of time anyway? Trying to do the work ourselves instead of letting God have the plow or the wheel. I’m reminded of what Jesus said in Matthew 11:28 “Come unto Me, all ye that labour and are heavy laden, and I will give you rest.” (Not that I would ever have been so bold to ask God to go talk to that pig and tell her to sneak out of the pasture and come to the back of the property to reunite with her girlfriends – LOL ) But, that is just what happened and I am thankful… and amazed! My sister lives too far away from me in Virginia. When I tell her these stories she always tells me I should write a book. Well, maybe someday I will, but for now I plan to share a few stories off and on here. 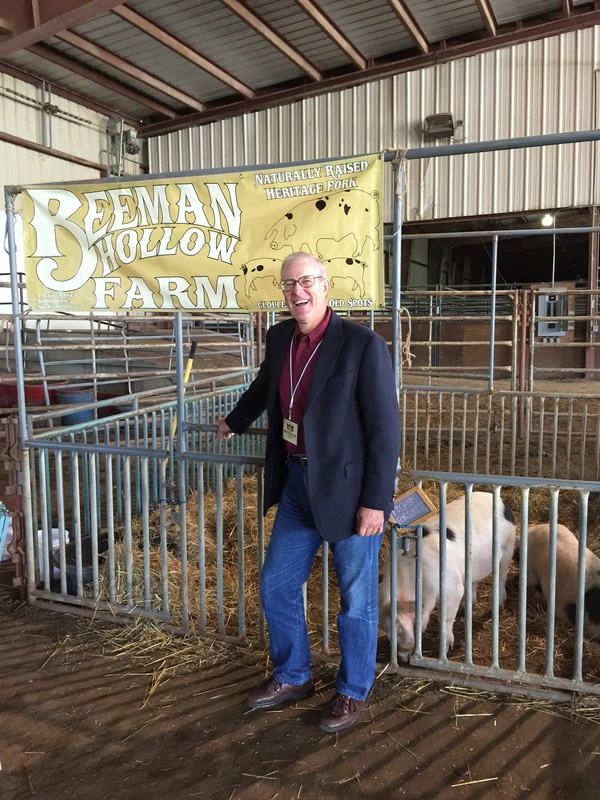 We are just making memories here on the farm in Beeman Hollow. As our Gloucestershire Old Spot pigs were about to farrow, we made sure all of the outbuildings had some nice fresh straw in them for the little piglets. However, when the time came, both of our sows thought they would just have those pigs out in the pasture in the shade. (Sounds like a good idea). One sow was not too keen on us messing with her babies. The other one couldn’t care less. Daughter in-law helped with some routine checking yesterday. Looks like we have a bunch of boars. We will be selling all of our gilsts as they are related to our Dudley and our sows now. The farm is shaping up and I’ve mostly been posting on our Facebook page. But, there is so much going on I think I’m going to go back to this blog. Looking out at the wintry mix coming down really hard, it’s hard to believe that yesterday’s chores didn’t even require a jacket. 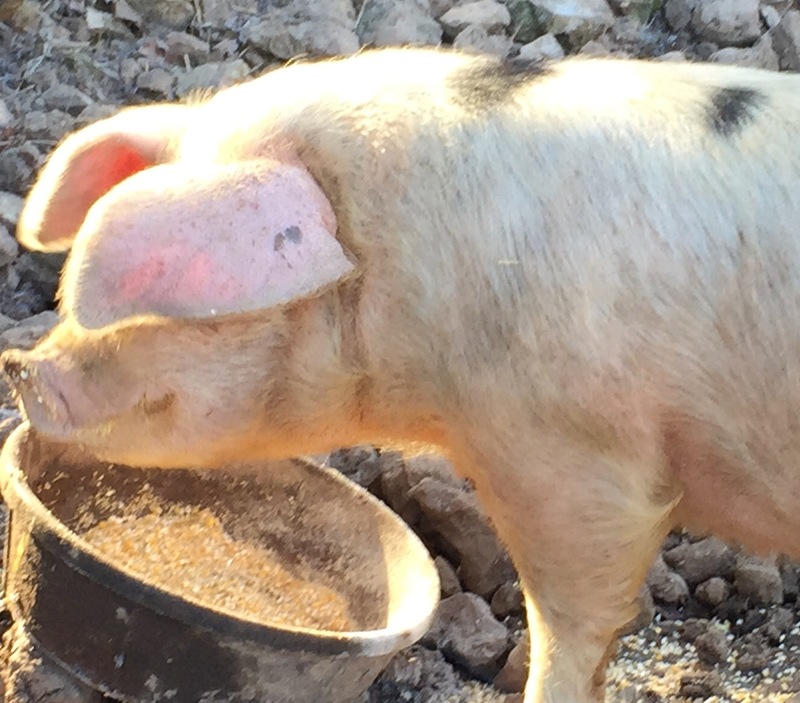 I am glad to announce that both of our Gloucestershire Old Spot gilts have been bred, so Lord willing, in 3 months, 3 weeks and 3 days from two weeks ago we will have some little spotted baby piglets. At that point we will be selling some breeding stock and making the rest into pork. 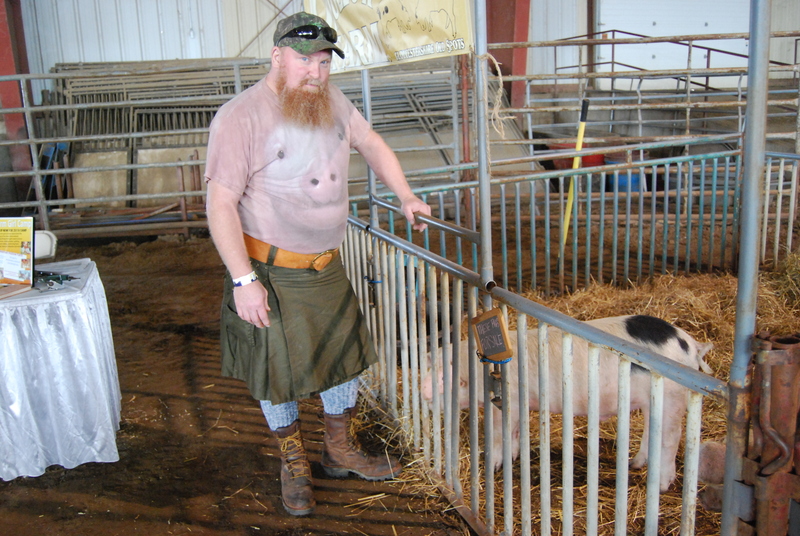 We will also 1/2 and whole pork available as a CSA. I will post more information about what a CSA is in another post. Our turkeys are also breeding, so we are hoping to have enough heritage turkeys in the fall for our own Thanksgiving and to raise a few for some others. Until then, I’m not sure what happened to spring, but I think it didn’t get the memo. It’s going to be below zero tonight. Everything is fed outside and ready for bed. 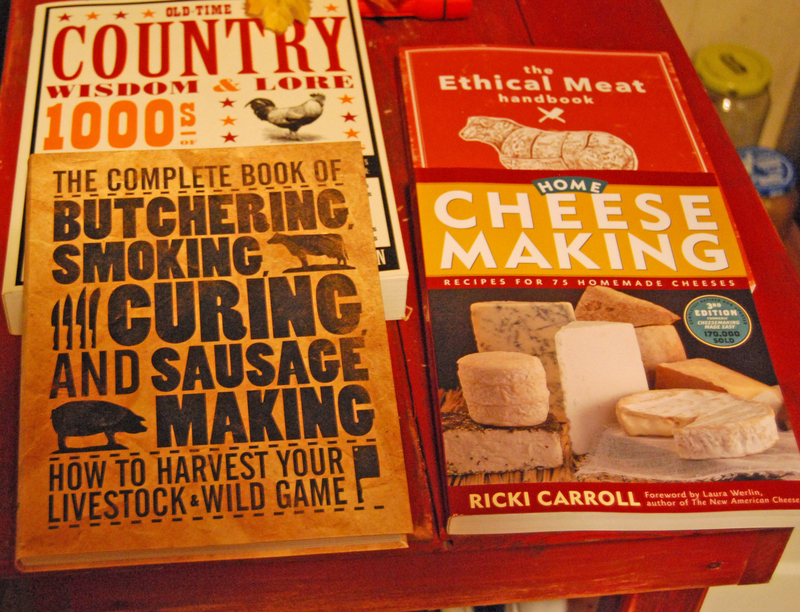 Inside, cooking up some heritage pork chops, organic potatoes and corn. Then relax and wait for spring. 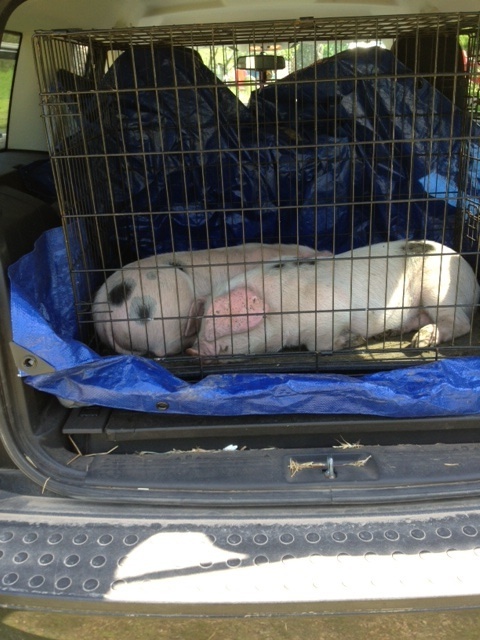 Who needs a truck when you can drive 2 hours with pigs in the back of the SUV. 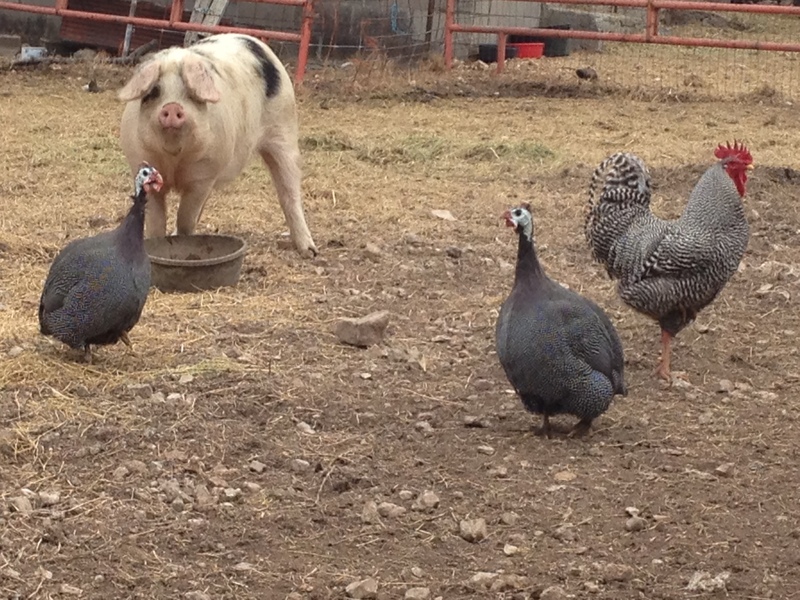 Our Narragansett turkey pair were added to the farm last week. They have settled in just fine, enough that the hen has been laying eggs almost every day. We put them in the nest for her but she’s not too interested in setting yet. She might still be a little nervous in her new environment. Of course, Pierre, our faithful rooster has fallen in love the the hen. He stands there all day long looking into the cage – and I really mean ALL DAY. The Tom Turkey, who has no name yet, doesn’t seem to like it. Sometime in the middle of doing everything else, I managed to bring home five little baby quail chicks. They are noisy, fretful little things. Not like the Buff Orpington chicks. If they manage to not get eaten by raccoons and become full grown, they will be great watchdogs. This weekend, our little heritage pigs came home. We reserved them before they were born. After much research on heritage breeds we decided on Gloucestershire Old Spots. I love the looks of them, but their temperament and thriftiness were definitely right up there for the reasons we chose them. They are already so calm and friendly. They hardly flinched when the grandkids today pet their noses. Well, not until the kids decided that chasing them would be more fun.